One person has died and 11 are injured after scaffolding collapsed at the Ritz Hotel in Madrid, where building work has been under way. The city's emergency services said part of the sixth floor had come down, with reports it fell down to the first. Two of the wounded were taken to hospital with serious injuries, while the others were less badly hurt. All those involved were working on the renovation. At least three had to be pulled from the rubble, AFP reports. The collapse happened shortly after 16:00 local time (14:00 GMT). Emergency services tweeted pictures and footage of the scene. Reports say the collapse happened in the inner courtyard of the 110-year old hotel. 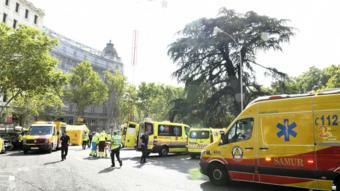 Witnesses told Spanish newspaper La Vanguardia that scaffolding and some of the building's structure collapsed.